I always thought ‘Chocolate Surprise’ would have been a great name for this pudding – the surprise being that it is lemon. I liked the idea that the person making it for the first time, despite adding nothing vaguely related to chocolate, might on one level expect it to turn into chocolate in the oven. But to be loyal to my mum, its real name is Lemon Thing; and I could eat a whole one, no matter what size. Take 20z butter and 4oz sugar and cream together till light and fluffy. Add 2 egg yolks to the mix and reserve the whites in a dish. Mix vigorously, as you pour half a pint of milk into the mixture and stir in the zest and juice of 1 lemon. The pale yellow mix will curdle a little. 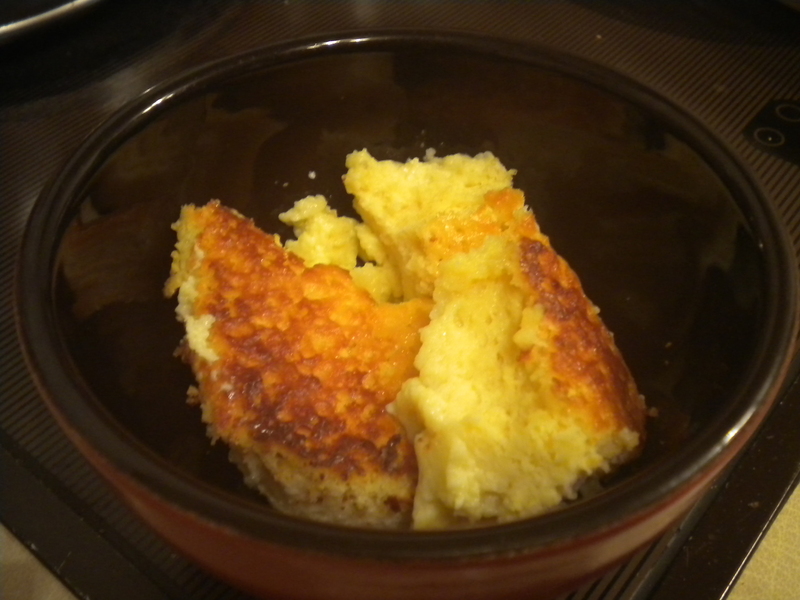 Fold in 2oz self-raising flour and pour in another half pint of milk and the zest and juice of 1 more lemon. Whisk the 2 egg whites until you get a lot of foam and fold into the mixture. You want a preheated oven at 180 deg C.
Pour the mixture into a baking dish and bring it back out 1 hour later with a spongey top and a precarious wobble. At it’s best, you get a lemon custard sauce under the cake; at worst the custard gets a little more eggy, but nonetheless, delectable.